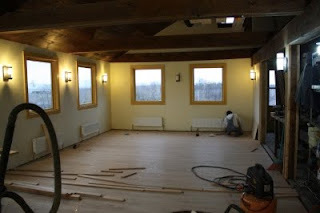 I might have mentioned yesterday, but flooring, even with a pneumatic nailer, is back-breaking work. Nevertheless, the girls, E! and Sarah, did a fantastic job today working on the floor. 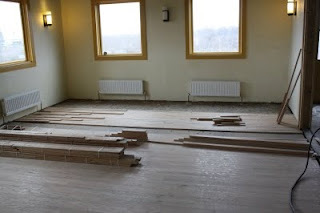 The key to successful flooring is to lay out several rows in advance, and then nail them down. We got it all done today. Jeff, our plumber / air conditioning meister, was back today to finish installing the registers in the A/C duct. Things are moving, people, get ready, get excited (I know you are all already ready and excited - OK, this sounds totally convoluted), be there when it happens. You got it done?!? YEY you got it done! B.I.G. ups to the ladies!